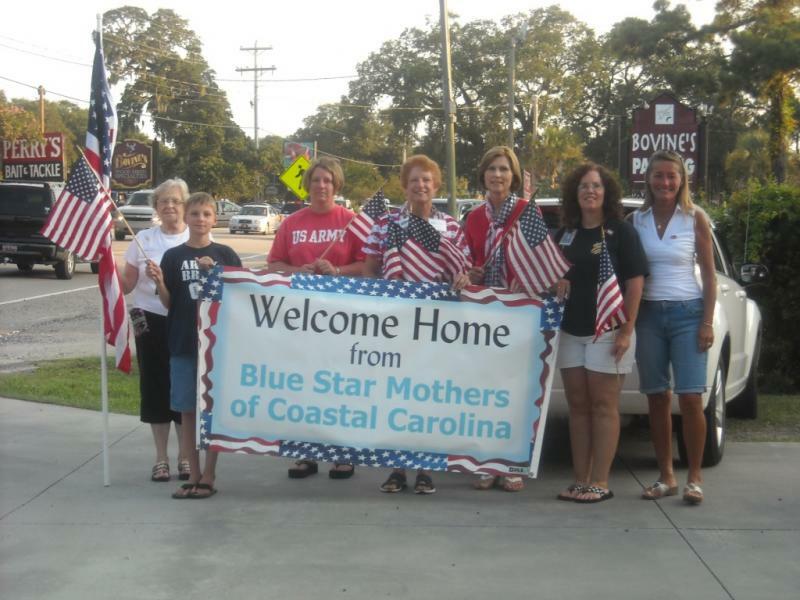 Blue Star Mothers of Coastal Carolina - HomeComings!! This is best page of all! 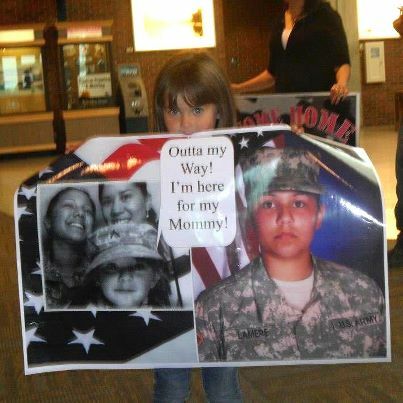 Here we get to display pictures of the Welcome Home events. There is no better feeling in the world than seeing them for the first time!! 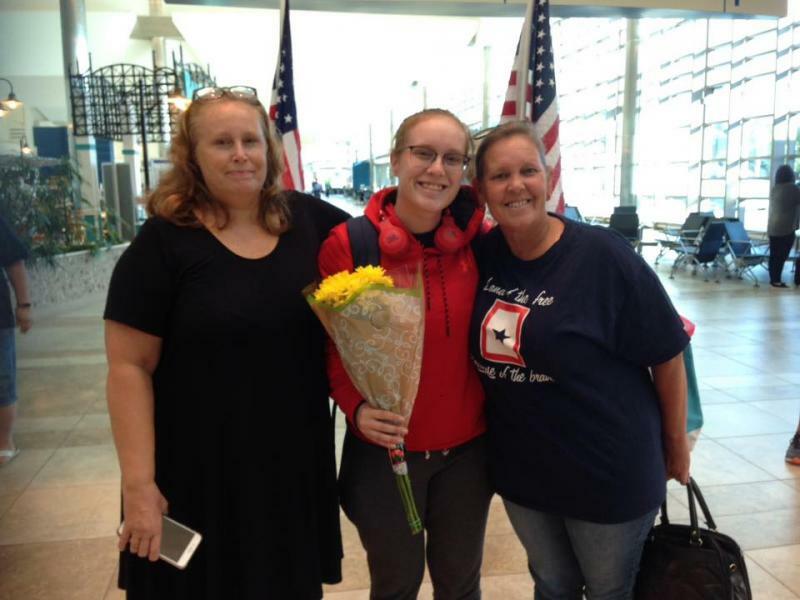 Welcome Home to Marine LCPL Ashley Gerrald, who arrived home on leave from her duty station in Okinawa on Sunday, September 23, 2018.
tour of duty in Iraq!! 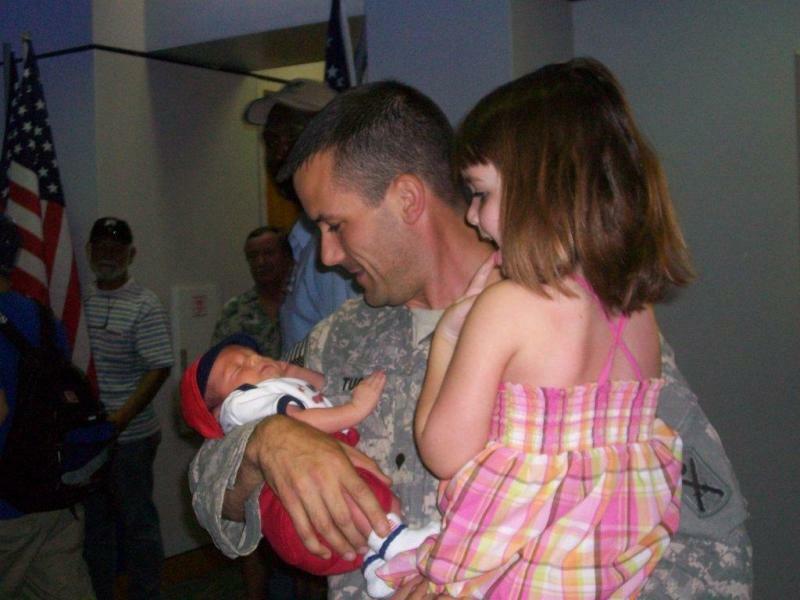 Four Army National Guard personnel returned from a 6-month deployment to Afghanistan on December 16, 2013...just in time to spend the holidays with their families. 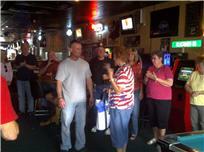 We also welcomed a Navy serviceman returning from a 3-year tour-of-duty in Japan!! 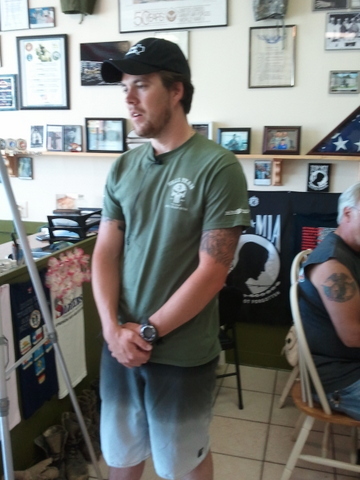 Army veteran Nicholas Ferry, son of BSMCC Member Denise Fassbender, joined BSMCC for lunch at the Veterans Cafe on Saturday, June 15, 2013. 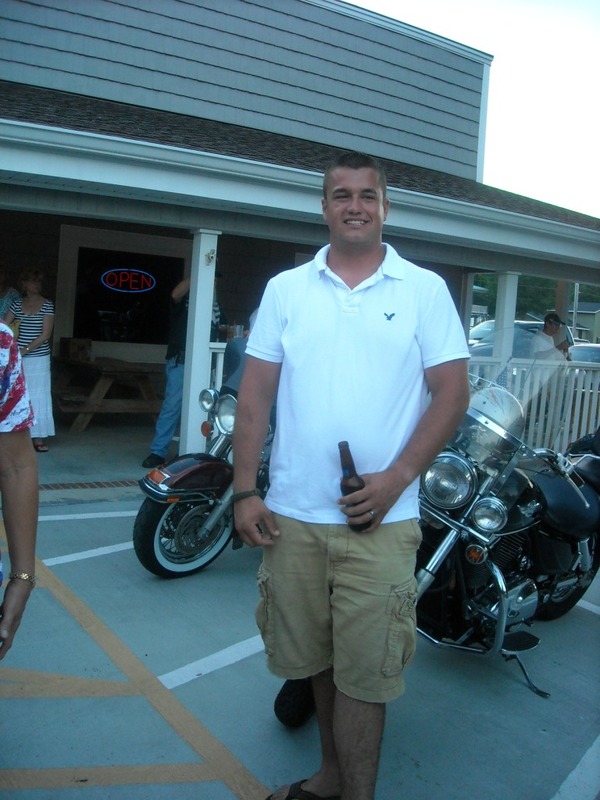 Thank you for your service, Nicholas!! 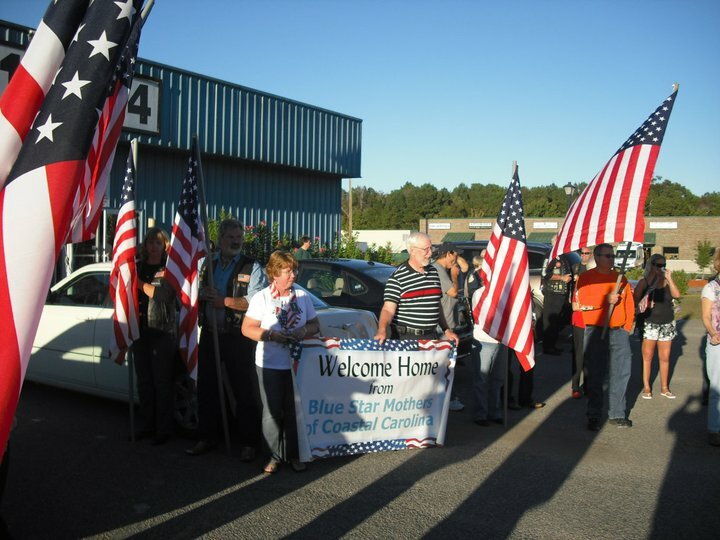 On Tuesday, June 4, 2013, 35 members of the 1/118th Army National Guard Combined Arms Battalion arrived home at the Conway, SC, Armory following a year-long deployment to Kosovo. 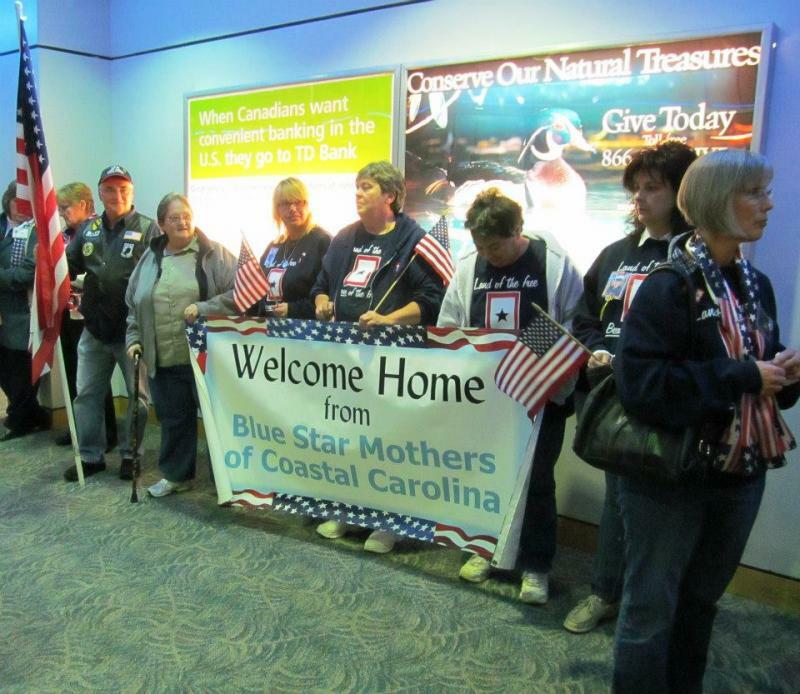 Blue Star Mothers of Coastal Carolina joined with other supporters of Operation Welcome Home of Myrtle Beach to provide cheers of thanks for their service and lots of refreshments for the soldiers and their families. 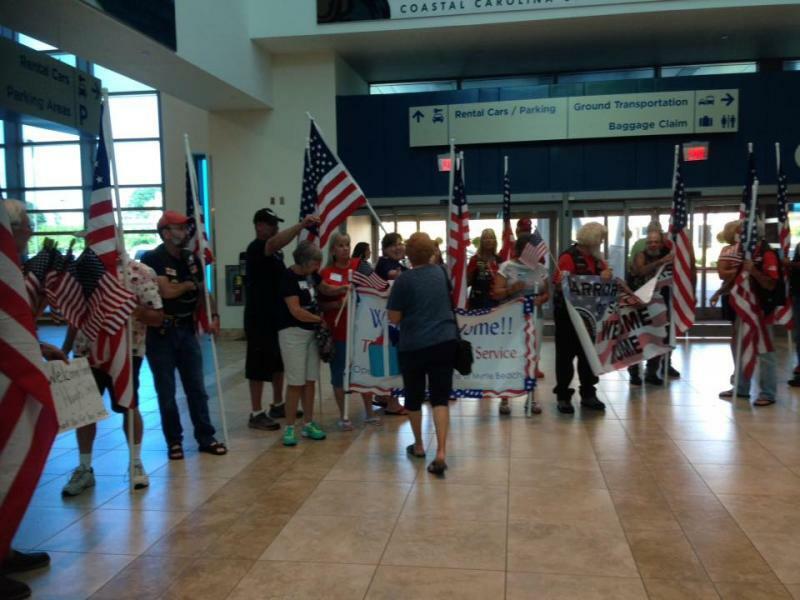 Wounded Warriors from several military bases arrived in Myrtle Beach for Military Appreciation Days and the Memorial Day Weekend in Myrtle Beach on Friday, May 24, 2013. 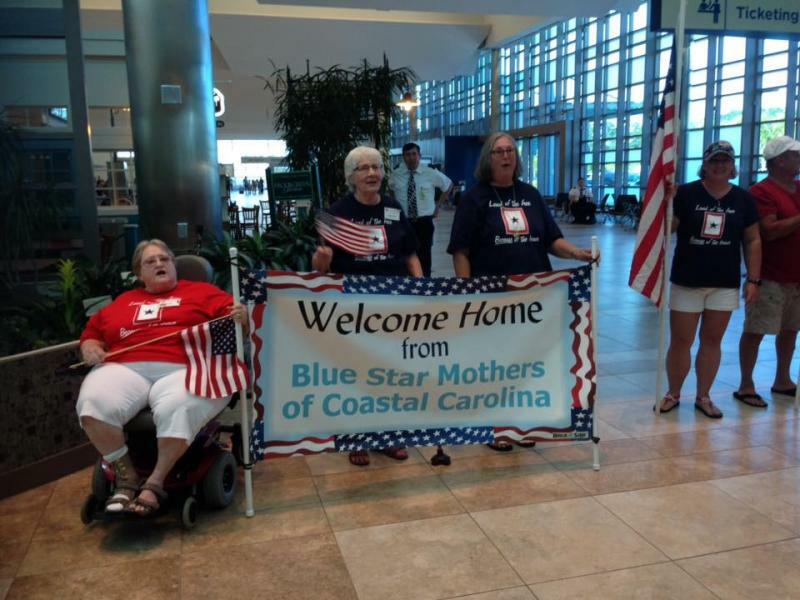 Blue Star Mothers of Coastal Carolina were there to welcome them and thank them for their service. 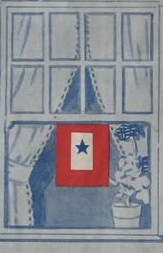 The time spent away from the grueling rehabilitation in the military hospitals is a real treat for these Heroes. 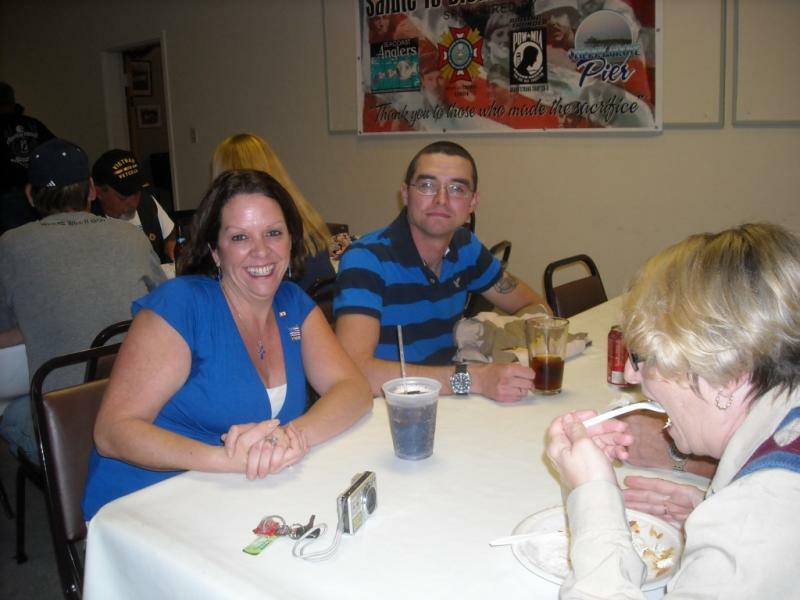 Thanks to Scents for Soldiers for sponsoring this event. 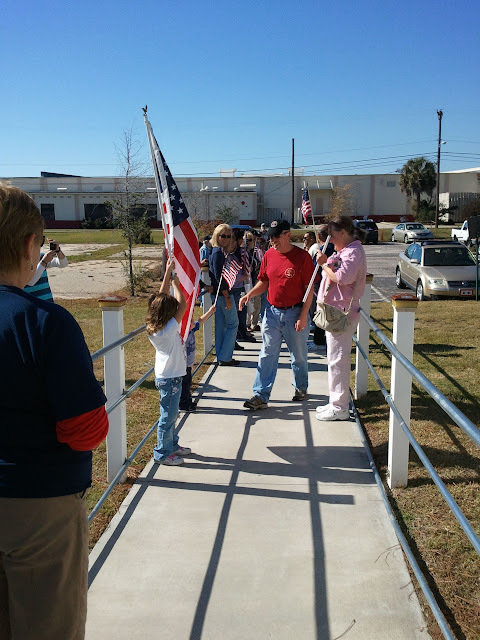 On Wednesday, March 27, 2013, Army SPC Alex Hamlin came to Myrtle Beach to begin block leave following a recent deployment to Afghanistan. 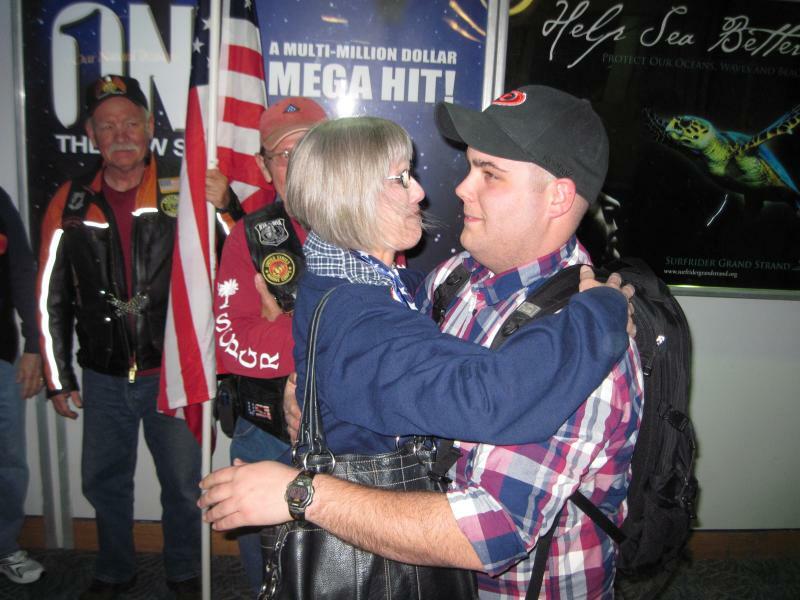 Thanks to so many who came out at 10 p.m. to give a rousing welcome home to this fine young man!! 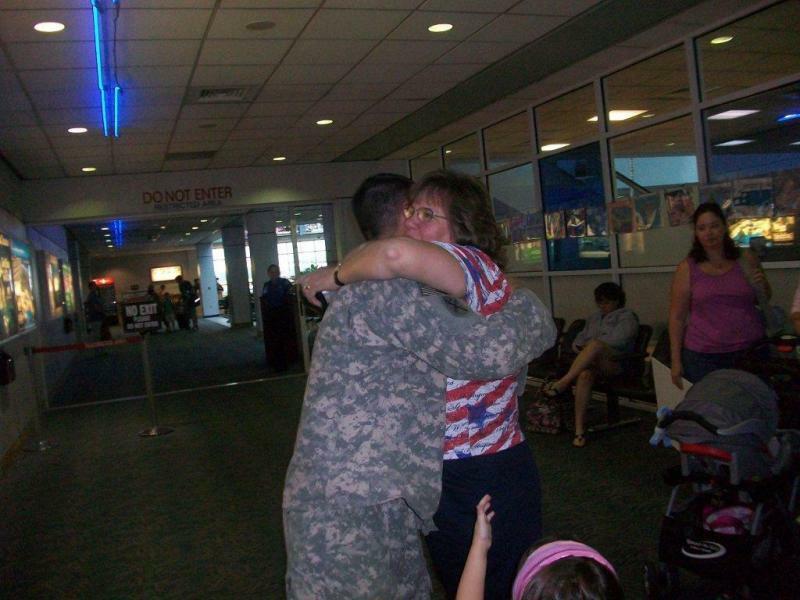 Blue Star Mom, Nita Smoot, waits anxiously to give a hug to her son. And, there is that big hug!! Thanks for your service, Alex. 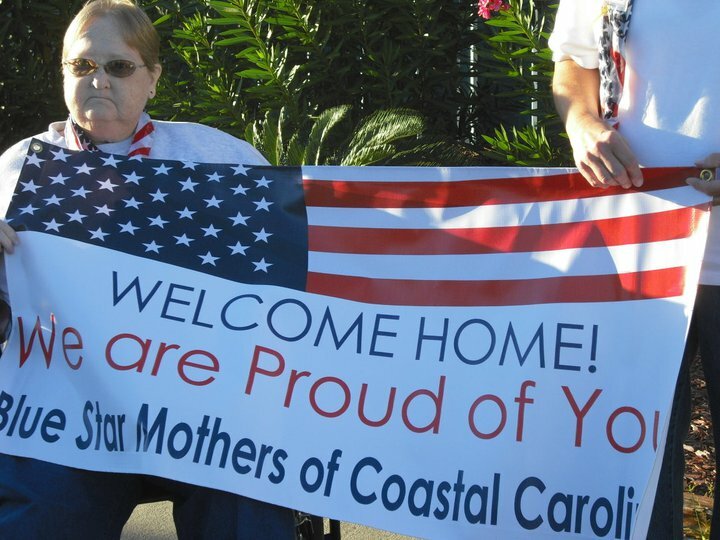 Although this picture was not from one of "our" Homecomings in Myrtle Beach, it says it all for children waiting for their parents to return from deployment!! A year is a Long Time away from your son!! Welcome Home and Sorry to see you go party! 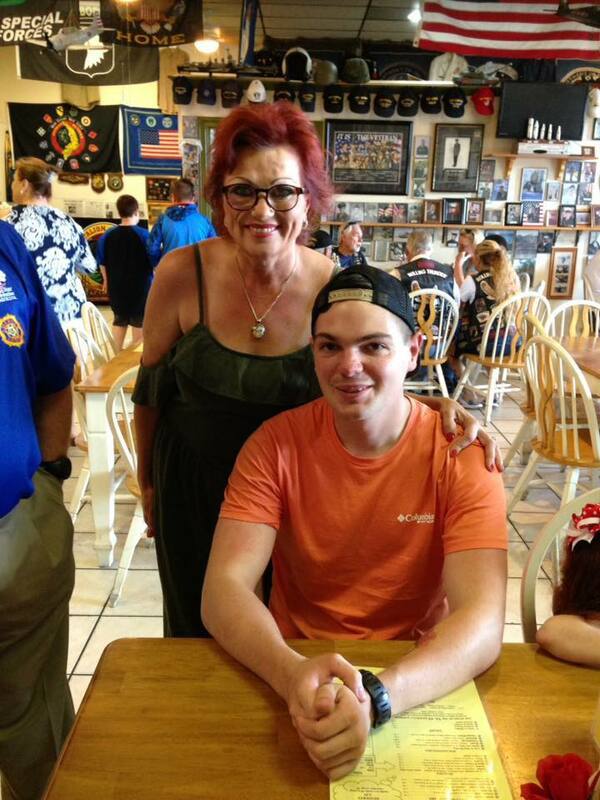 SFC Cobby McDonald, US Army from Ft Carson, CO came to visit his Mom Rita Parks before leaving for Afghanistan. Be safe Cobby and return soon! 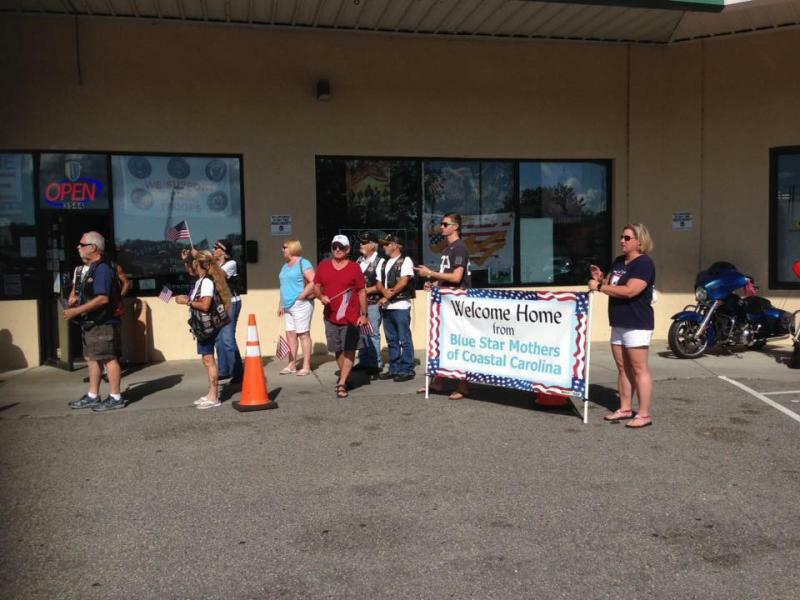 Welcome Home Casey & Lane Higson!!!!! 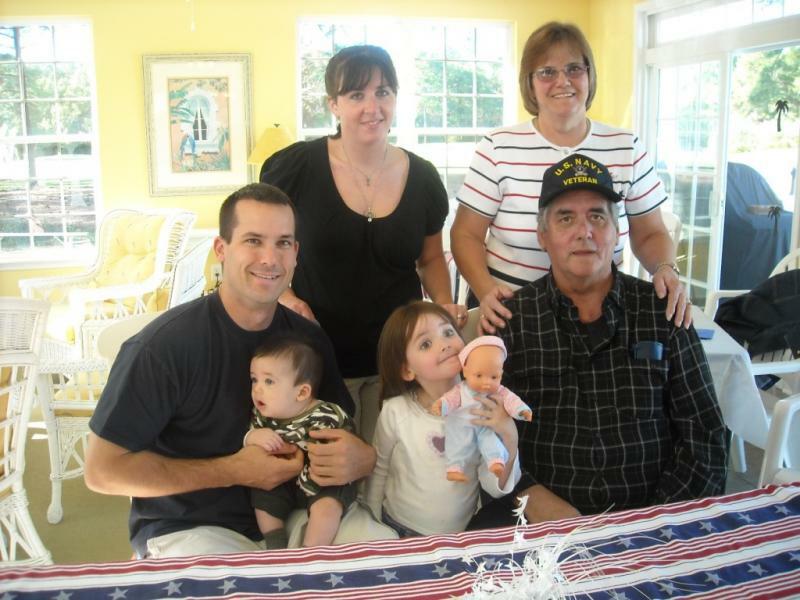 STEVEN ALONG WITH HIS WIFE, DAUGHTER AND NEW SON BORN WHILE HE WAS DEPLOYED. 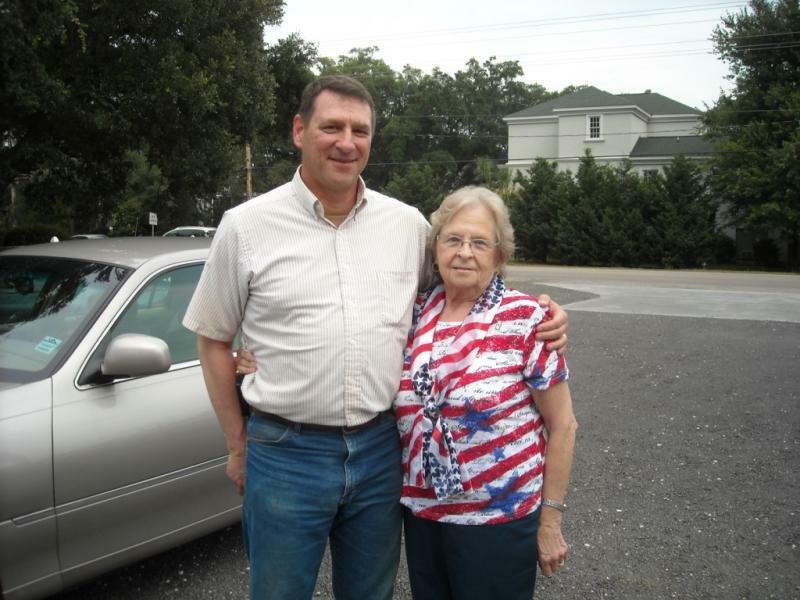 PLUS BSM MOM LINDA TUCKER AND DAD ED. 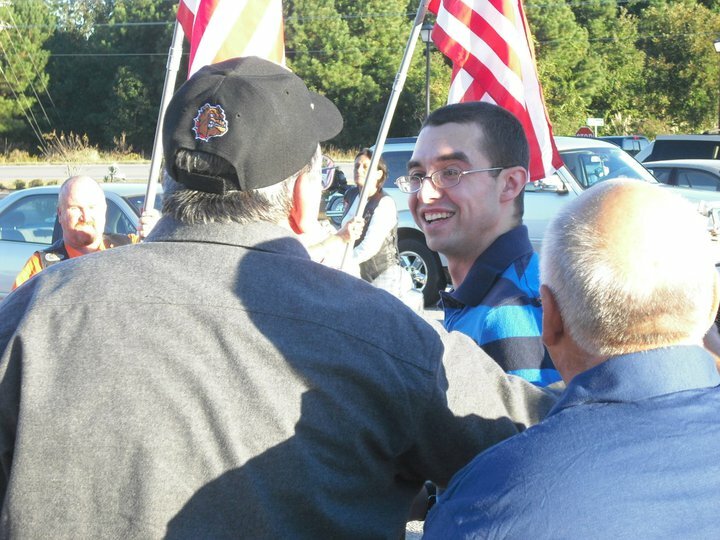 Welcome Home to US ARMY SGT. Sean McCann on R & R from Afghanistan!!!! 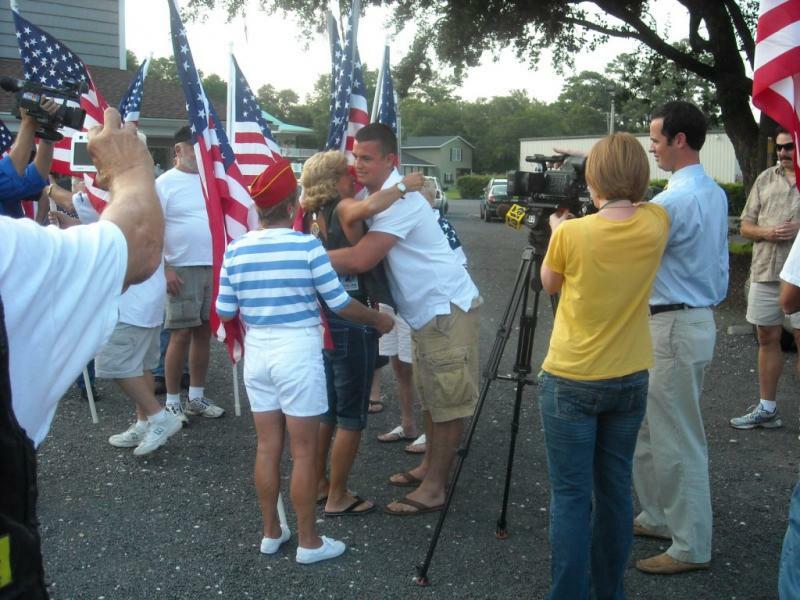 US Army SPC Stephen Leimbach home from Afghanistan!!! 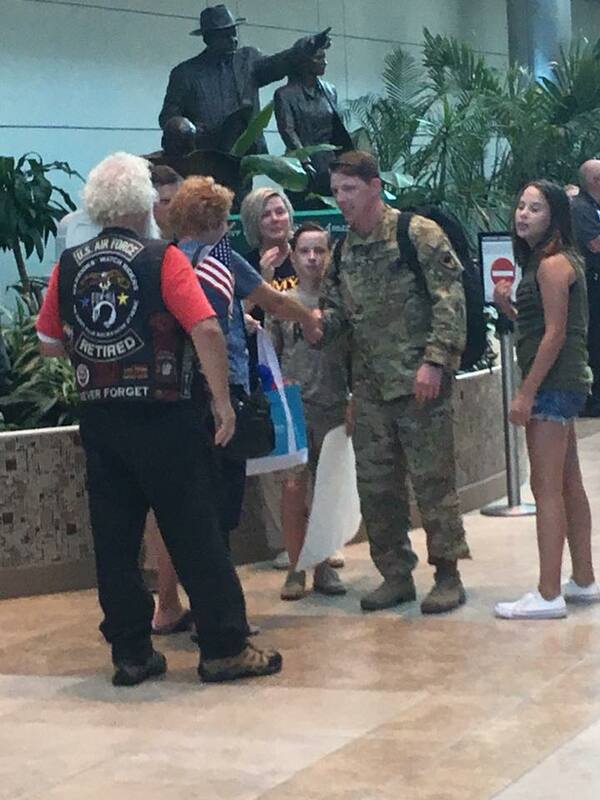 US Army Major John Dufresne, Welcome Home! 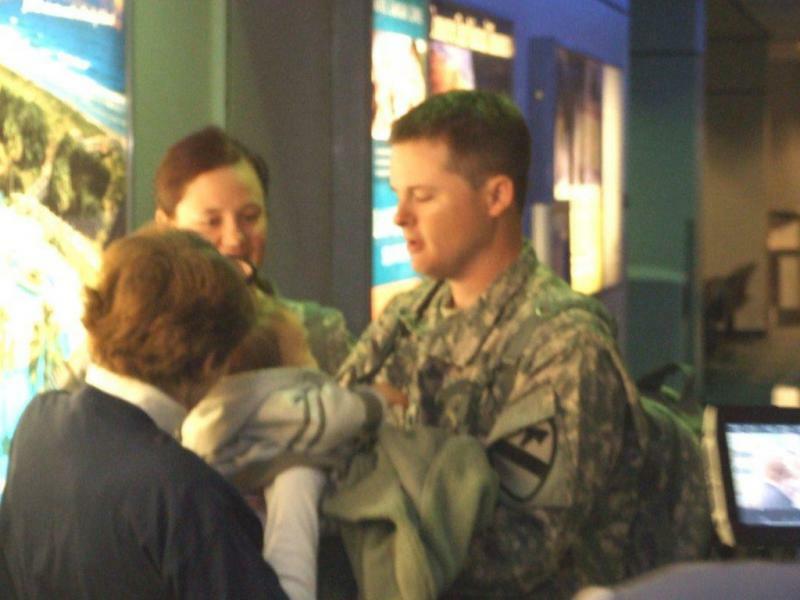 SPC Stephen Tucker home on R & R meets his 8 day old son for the first time! 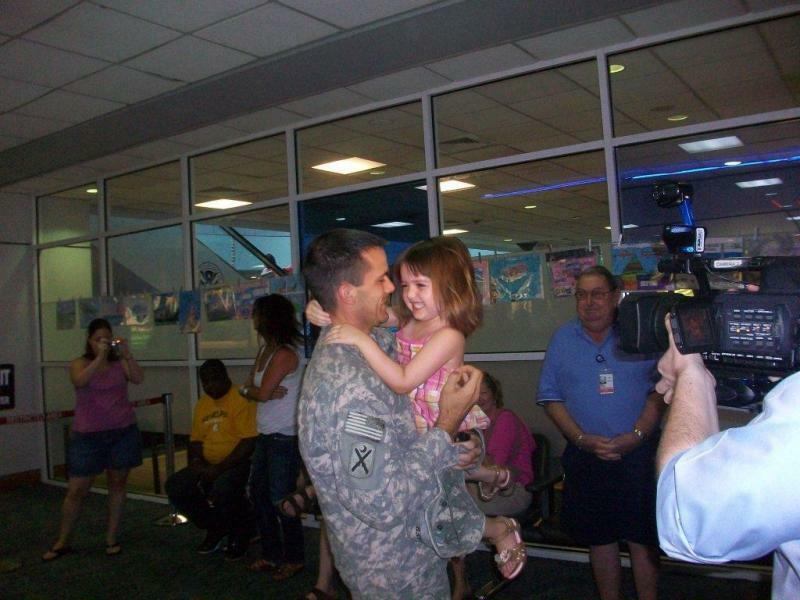 And 4 year old daughter missed Daddy alot! And BSMCC Mom Linda Tucker!! 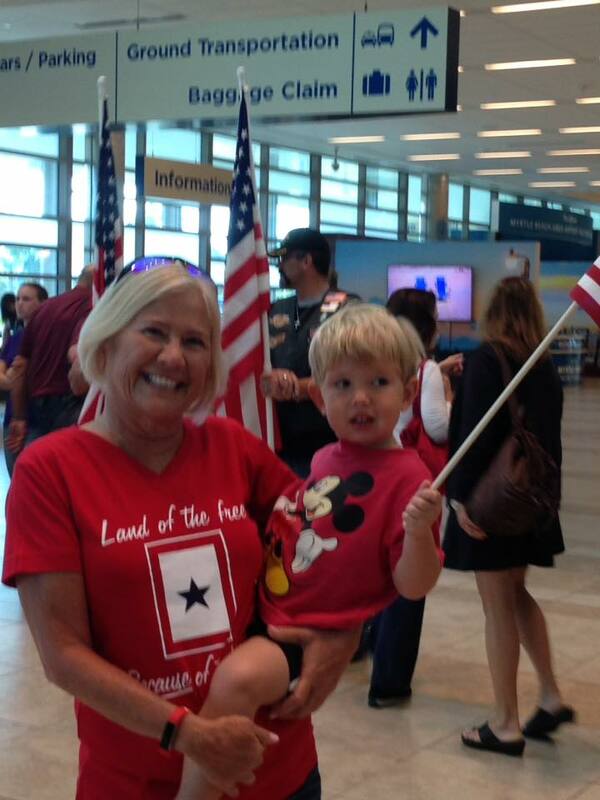 Tami Bailey welcomes home her son Airmen First Class Woody Walkup from his tour of Afghanistan! Yeah!